If you've grown up in the NY metro area, moving away can be a very difficult thing. The reasons are many, but ranking pretty high has got to be the almost complete and utter lack of Italian bakeries. And if there are no Italian bakeries, there are no cannolis. 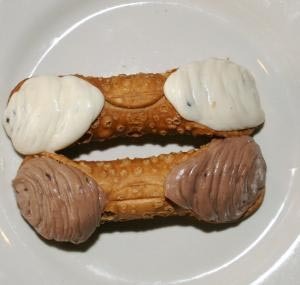 Thank your lucky stars that Dominick's Bakery Cafe of Staten Island offers the Cannoligram service, which offers shippable cannoli kits. Admittedly, the website could use some work--but the product is solid. They sell kits which include cannoli shells and cannoli filling in a separate pastry bag, so that you can fill them directly before eating (just like on Mulberry Street!). The jumbo vanilla cannoligram is $32.99 and includes 12 pastry shells; or, for just five dollars more go for half-vanilla, half-chocolate cream. The online bakery also offers treats such as lobster tails and sfogliatella, which are as rare in Seattle as Dunkin Donuts locations. Send one as a care package to someone you love...or maybe just to yourself.